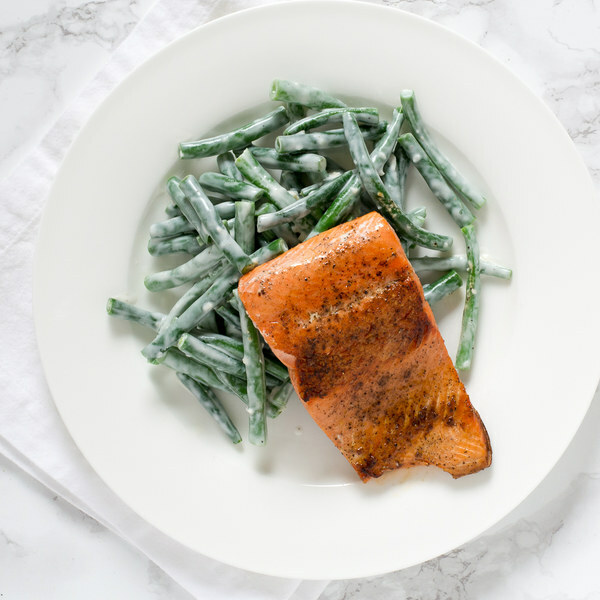 ← Pan-Fried Salmon with Creamy Green Beans. Trim and discard the ends of the green beans, then halve the green beans and transfer to a medium bowl. Juice the lemon into a large salad bowl. Trim off and discard the root ends of the garlic; peel and mince or press the garlic. Add to the lemon juice. Once the water in the saucepan is boiling, add the green beans. Cook until bright green and tender-crisp, 3 to 4 minutes. Once done, drain in a colander and rinse under cold water to stop the cooking process. Set aside to drain further. To the lemon juice and garlic, add yogurt, olive oil, salt, and pepper; whisk together. While the skillet heats up, pat the salmon dry with paper towels and place on a plate; season generously with salt and pepper on both sides. Carefully place the salmon, skin-side-down, in the skillet; cook until the flesh is opaque and flaky, 3 to 4 minutes per side (depending on thickness). Once done, transfer the salmon to a plate. Add the green beans to the salad bowl and toss to thoroughly coat in the dressing. To serve, divide the green beans and salmon between plates. Enjoy!